Located at the base of Park City Mountain Resort with easy access to Deer Valley and Canyons Village. The MJLodge is 1,350 square feet of heaven! We offer 2 bedrooms plus a very large enclosed loft bedroom. The layout was designed for entertaining friends and family. The lodge offers awesome views of the 16th fairway at the Park City Golf Club. Remodeled and meticulously maintained making it your 'home away from home'. The MJLodge is finished with high quality furnishing including Serta beds, high thread count linens, spa quality bath accessories, large flat screen HDTV's and high end appliances. All of these items make this a true luxury retreat. You will find plush carpet, hand hued hickory and slate floors. We round out the luxury lodge feel and finish with alder cabinets and rough sawn timbers and molding. The MJLodge is located 150 yards walking distance from the 'Park City Mountain Resort' lower ticket office , Three Kings, First Time and Eagle lifts. Take advantage of the Park City bus system and take a free 2 minute bus ride to the PCMR resort center. 'Deer Valley' is 5 minutes, 'Canyons Village' is 10 minutes and 'Main Street' is 5 minutes via the free bus. The bus stop is located just steps from your front door. Enjoy the heated pool and huge hot tub open for both the summer and winter season located next door at the club house. Come and experience 'The Best Snow on Earth' or enjoy 'The Best Summer on Earth' here at the MJLodge. Pool and hot tub are open Thanksgiving to April 15, Memorial Day to Labor Day. Cancellation Policy: 100% refund minus credit card fees 60+ days. 50% refund 45-59 days. No refunds 0-44 days from rental date. We have been coming to Park City since 1975. We have always enjoyed the 4 seasons, entertainment, food and recreation available. We purchased the MJLodge and completed our dream of many years. We completely remolded the condo from the studs out and created our dream play house. You and your family are welcome! We invite you to experience and enjoy the cool summers and the awesome winters at the MJLodge. Location, Location, Location! 150 yards from the lower ticket office, on the golf course and hiking and biking trails. On the free bus system so need for a car. Golfing - Located on the 16th fairway of the Park City Golf Club Skiing - 150 from the lower ticket office and Three Kings, First Time and Eagle ski lift. Biking - The Spiro trail is just a block away and offers spectacular trails Eating - If you enjoy eating, Park City is the place. Movies - Movie theaters are just 2 blocks away Carmel Apple - You have to try the Apple Pie Carmel apple from the Rocky Mountain Chocolate Factory located at the resort center or downtown. Washer and dryer located in the Condo and another set available in the condo common area. 1 dedicated covered parking stall. Other Outdoor parking available on a first come first serve basis. Fully stocked with spices, oil, coffee and other cooking accessories. Room for 5 at the bar. 3 courts are available and the city park located 2 blocks from the condo. Wonderful owner; responsive. Great condo in a fantastic location-- walking distance to resort center and chairlifts. Excellent for family vacations. Two families shared the condo - plenty of space with the separate loft space for the kids. Condo is well stocked and has everything you need. Location is great - easy walk to first time lift ( even with kids), right next to the pool and hot tub and only 0.5 miles to cross country skiing. Would definitely stay here again! Joanne - I am glad to hear you had a great trip. We look forward to seeing you the next time you are in Park City. Our family enjoyed staying at the MJLodge. It is extremely convenient to the Park City base, just a minute or two by car, and also to downtown. The big windows let in a lot of natural light and the climate control was consistent throughout the house. We would definitely come back. Could not be more pleased. Stayed 4 nights on a 3 day father/son ski trip. Condo is a 2 minute bus ride or 7-8 minute walk to the mountain. Assigned underground parking spot if you have a car. Master suite downstairs and bed/bath upstairs gave us each our own quarters. Upstairs could accommodate 5-6 people. The condo is very nice, very clean, and well stocked. If you like cooking in, you have everything you need. Communication with the owner was great. Mark responded to emails quickly, called to check on us while we were there, and answered the phone when I had a question. 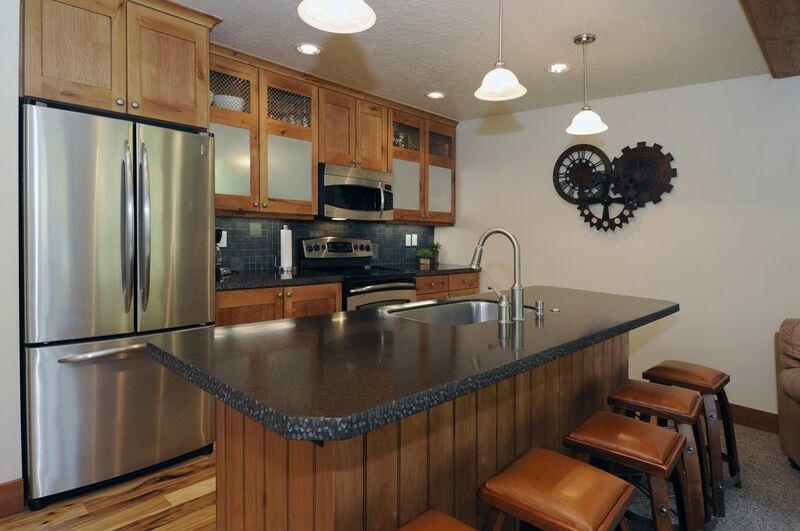 2nd trip to Park City and would not hesitate to return to this condo. Highly recommended. We had a wonderful week at the MJLodge. I travelled with my three teenage sons, my husband and my mother. There was plenty of room for everyone. The house is very well stocked with toiletries, laundry detergent, kitchen essentials. The beds are super comfortable and you can't beat the location. We had over 50" of snow in our 7 days and the condo does a great job of keeping the walkways clear. It has a beautiful view out the back of the snow and the cross country skiers. We used the nice big hot tub every night. We will definitely come back. Great property, extremely well kitted out and lovely ambience. This was our second stay and we would highly recommend it. The MJLodge is located at the base of Park City Mountain resort. An easy 200 steps from the lower ticket office, Three Kings, First time and Eagle lift. You can ski in if we have enough snow on the golf course.